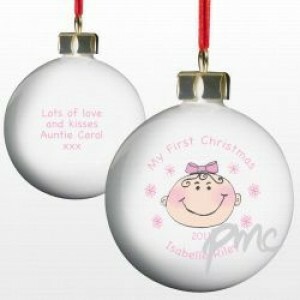 Personalised Baby Girl's 1st Christmas Bauble is a cute bauble to celebrate a little ones first christmas. Personalised with baby's name (maximum of 20 letters)and year on the front and a personal message up to 45 characters on reverse. As shown in the photo. A really lovely memento for your special baby girl's 1st Christmas - made from fine bone china.